Wall plate with dual XLR connectors for running cables from control rooms to a vocal booth or live room. 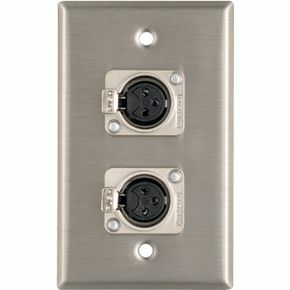 The Pro Co WP1013 is a loaded, one gang stainless steel wall plate featuring two female XLR connectors. Whether you're adding a vocal booth to your home studio or putting together your own pro facility the Pro Co XLR wall plate is cost-effective and quality-built.